Lava Girl Surf presents Women of the Seven Seas, the 2nd annual New York Women’s Surf Film Festival. 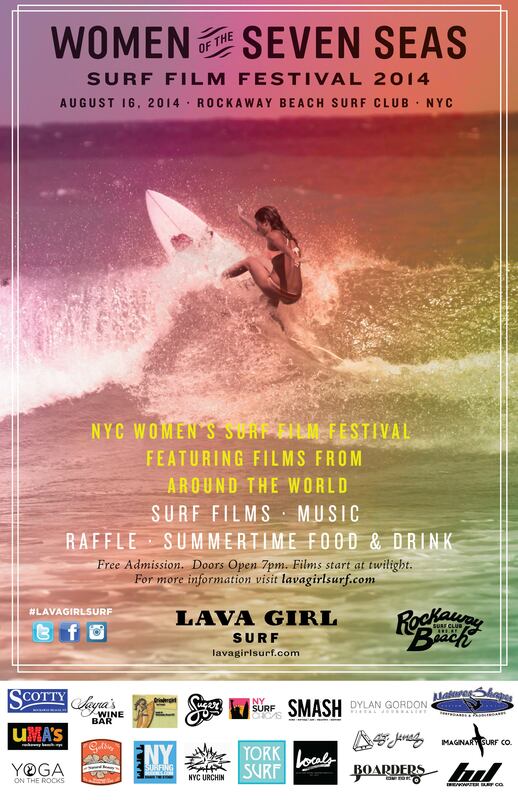 Lava Girl Surf, The women’s surfing, education and events company, presents Women Of the Seven Seas, the New York women’s surf film festival, at the Rockaway Beach Surf Club on Saturday, August 16. The New York Women’s Surf Film festival celebrates the filmmakers and female wave riders who live to surf, highlighting their sense of adventure, connection to the ocean and love for their own communities and those they discover. At Women of the Seven Seas here in Rockaway Beach, New York, we’ll share the spirit and inspiration of the talk story of women wave riders from around the globe. The festival will include Beyond the Surface, directed by Crystal Thornburg-Homcy and David Homcy. The full-length film features Ishita Malaviya, India’s first female surfer, who is joined by a unique and talented group of women – Crystal Thornburg-Homcy, Liz Clark, Lauren Hill, Emi Koch, and Kate Baldwin. With unshakable determination for a better world they traveled through Southern India documenting the ways in which surfing, yoga, and ecological creativity are bringing hope and fueling change for local people and the Planet. They will also be premiering Say No More, the epic tale of women’s longboard surfing. Directed and Produced by Birdman Media (Taylor Larison). Say No More, a full-length film, highlights the talents of some of Southern California’s elite team of female shredders: Stephanie Vigiano, Karina Rozunko, Tory Gilkerson, Erin Ashley, Lindsay Steinriede Engle, and Makala Smith. Delivering groundbreaking carves and long nose rides with a message that transcends well beyond the lineup, the film shows strength, style and grace in the water elevating women’s surfing to fantastic new heights. Involvement Dream, a short film by filmmaker Nathan Oldfield, featuring Patagonia Ambassador Belinda Baggs, in NSW Australia, riding a surfboard designed in 1968 by fellow Patagonia Ambassador Wayne Lynch. This design came to Wayne in a dream and he called it the Involvement Model. It became the one board quiver that he rode around the world. Nearly 45 years later, Belinda explores what riding that surfboard feels like. Summer Salad, a short film, by filmmaker Hayley Gordon shot in southern California depicting friends doing what they do best, surf, skate and party. It’s a great snap shot of what happens when the swell doesn’t come in consistently, featuring Taylor Beatty, Sara Taylor, Jenna Balester, Amy Caron, Vanessa Torres, Erin Ashley (Worm), Ornella Pellizzari and more. Frankie is a short film shot by Morgan Maaseen, a Californian-based photographer and filmmaker. Catch a glimpse of teenage surfer girl Frankie Harrer, as she surfs in Hawaii and a big day at Teahupo’o—one of the heaviest waves in the world. There’s Something about Mary, a short film by New York-based filmmaker Davina Grincevicius, shot on Puerto Rico’s west coast, it features the energy, personality and wave riding talents of Mary Schmader, a soul surfer from North Carolina. There will be raffling a number of great prizes, including a Natures Shapes surfboard, a Imaginary Surf Co. handplane and Tee shirt, 20 x 30 signed print by talented photographer Dylan Gordon, a massage and yoga package by Yoga on the Rocks, gift certificate for Uma’s Restaurant and from Sayra’s Wine Bar, body care gift bag by Goldie’s Natural Beauty, amazing surf gear and apparel by Breakwater Surf Co, Grinder Girl, St James Clothing, Boarders Surf Shop, Suger and Scotty Bags as well as a surf lesson by Locals Surf School. Come early, have a drink, grab some dinner and get a good seat because it’s going to be a great night of music and films.